Undae! 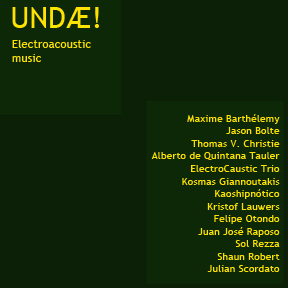 Electroacoustic Music I and II is a selection of the call for works 2014-2016 for the Undae Radio program on Radio Circulo. In these albums you can appreciate the work of different composers from different parts of the world and their way of working and adjacent electroacoustic music in the early years of the century. The first volume includes works by Maxime Barthélemy, Jason Bolte, Thomas V. Christie, Alberto Quintana Tauler, ElectroCaustic Trio, Kosmas Giannoutakis, Kaoshipnótico, Kristof Lauwers, Felipe Otondo, Juan José Raposo, Sol Rezza, Shaun Robert and Julian Scordato. On this seventh CD by the Logos M&M ensemble, a collection of newly built machines are presented individually. Where other CD releases give ample examples of what can be done when the robots come together to form an orchestra, this CD demonstrates the capacities of the new robots playing solo or as duos.The M&M orchestra is a professional group of dancers, performers, composers and musicians focusing on the interaction between man and machine, which has its permanent residence at the Logos Foundation. The machines are all electro-mechanical robots designed and built by Godfried-Willem Raes. 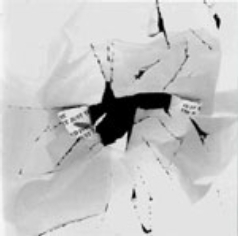 This CD reflects a momentary mid-2010 snapshot of the ongoing efforts of this unique ensemble to redefine musicianship. Building musical robots has been an ongoing activity in the Logos Labs since its very beginning in the late sixties. It is one of the many results of our investigations into the development of new tools for musical expression. All music on this CD is in the public domain. It can be freely distributed, even in public spaces, and can be broadcast provided the origin and the authors are always mentioned and given credit. The M&M ensemble is a group of performers, composers and musicians focussing on the interaction between man and machine and has its permanent residence at the Logos Foundation. The machines are all electro-mechanical robots designed and built by Godfried-Willem Raes. On this new CD, all the automats form an interactive orchestra: Some of the pieces are exclusively based on real-time composition-code, written for the computer network that controls the automats (Plastic Deformations by Kristof Lauwers and Amorgós by Jelle Meander). Other pieces involve real-time interactive input from human performers. This input can be acoustic, as in the case of Klanklagen and RobotGarden, two collaborations by Moniek Darge and Kristof Lauwers or gesture controlled like in the compositions Gestrobo Studies, PicRada Studies and SQEvSTO4QR by Godfried-Willem Raes. Building musical robots has been an ongoing activity in the Logos Labs since the very beginning in the late sixties. It is a logical outflow of our investigations into the development of new tools for musical expression. A mere consequence of the laboratory research into experimental instrument building. The automats documented individually on this CD are all pure acoustical: drums, organpipes, metal tubing, strings, bells, wood… However, these sound sources are exclusively activated by electromechanical means. On this CD compositions written for the logos M&M ensemble were brought together. This ensemble focusses on the interaction between man and machine and has its permanent residence at the Logos Foundation. The machines are all electro-mechanical robots designed and built by Godfried-Willem Raes. On this CD several automats form an orchestra. Some of the pieces are exclusively based on a composition-code, written for the computer network that controls the automats. Other pieces involve real-time interactive input from human performers. This input can be acoustic or gesture controlled. The CD reflects a momentary snapshot of the ongoing efforts of the ensemble to redefine musicianship. All kind of kitchen sounds were carefully recorded, cut and paste and finally transformed into an electro-acoustic composition. Most sounds are unrecognizable. Outside their normal environment the recorded sounds are getting a total new dimension. In the Mesopotanian Mythology, Ea was the earth and water god, but also the god of wisdom and the source of all magic.